Our 1-day first aid course lets you sail with the certainty of staying cool and responsive in medical emergencies. Our RYA First Aid at Sea training is well established worldwide and focuses on the treatment of medical problems at sea. This RYA / MCA approved 1st Aid certificate is recognized by the Swiss Maritime Navigation Office for the issuance of the “Hochseeschein” according to Article 4 (1) of the Hochseeausweis-Verordnung (SR 747.321.71). Drowning and near-drowning, how do we treat such victims? Each participant will receive a copy of the RYA First Aid Manual, which is ideal for on-board use. Good English skills are prerequisites for successfully completing the course. This applies to all RYA training and communication at sea worldwide. 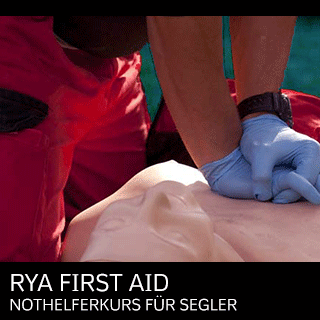 The RYA First Aid certificate is recognized in accordance with Article 4 (1) of the Hochseeausweis-Verordnung (SR 747.321.71).